"We don't get to eat a lot of food that's identical to what the ancient Romans would have eaten, which is one of the things that makes farro so fun. They must have had mushrooms and fermented cream back then, so it's easy to imagine Cleopatra and Mark Antony enjoying this dish." Place porcini mushrooms in a bowl and cover with warm water; soak until mushrooms are reconstituted, 20 to 30 minutes. Drain and chop mushrooms. Heat olive oil in a pot over medium-high heat. Saute brown mushrooms with a pinch of salt in hot oil until slightly golden and moisture cooks off, 5 to 10 minutes. Add chopped porcini mushrooms, reduce heat to medium, and cook and stir until hot, 2 to 4 minutes. Stir onion into mushrooms; cook and stir until translucent and golden, 5 to 7 minutes. Add garlic; cook and stir until fragrant, about 1 minute. 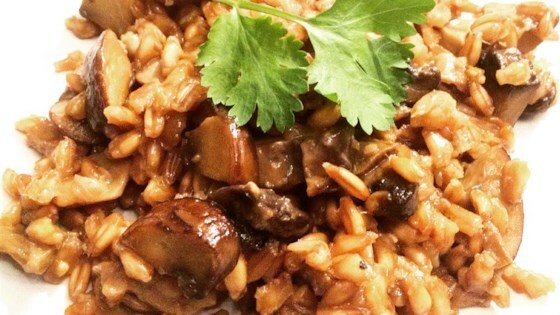 Pour farro into mushroom mixture; stir until farro is coated in olive oil. Increase heat to high and add 1 cup chicken broth with a pinch of salt to mushroom mixture; bring to a boil. Reduce heat to medium-low, cover the pot with a lid, and simmer, stirring once, until liquid is absorbed, about 10 minutes. Increase heat to high and stir remaining chicken broth into farro mixture; bring to a boil, reduce heat to medium-low, cover the pot with a lid, and simmer, stirring occasionally, until farro is starting to get tender, about 15 minutes. Remove the lid from the pot and continue simmering uncovered until farro reaches desired tenderness, about 15 minutes more. Reduce heat to low; stir creme fraiche and parsley into farro mixture. Season with salt and black pepper. Stir Parmigiano-Reggiano cheese into farro and ladle into bowls. You can buy dry farro in whole-grain form, but I prefer the pearled style, where the tougher outer layer has been polished down. Mine took about 40 to 45 minutes to cook, but that will depend on the brand you buy, as the sizes and amount of polishing can vary. You can strain and use the soaking liquid in the dish, but after only 20 minutes it's fairly weak, and I wanted the extra flavor of chicken broth, so I didn't use it. If you soak them for a longer time, and/or want to stay vegetarian, then go for it. I used assorted wild mushrooms and the broth that came from reconstituting them. This was great - I used Cremini mushroom caps and Black Trumpets in leiu of porcinis. Awesome as a side with salmon and a green. Will definitely make again! Really good. I used sour cream instead of creme fische. OMG OMG OMG! I didn't even use the dried porcini's (Couldn't find any in our small town) and it was amazing! Wow!!! So glad I stumbled upon this!